Top tax rates: Why it’s absolutely crazy that we don’t ask millionaires to pay more. Seriously. Time to pay up. This is just a stray, late-on-April 15 thought, but isn’t it kind of insane that we don’t ask millionaires to pay more in taxes? I mean, much, much more? Today, the top marginal income tax rate is 39.6 percent. Why not go to 50? Or higher? Some economists think we could go as high as almost 90 percent. Obviously, this is not a politically viable idea. We live during a time in which a supposedly serious presidential candidate can propose eliminating all taxes on capital gains or inheritances with a straight face, as if supporting the Hilton and Walton families were an existential national concern. Even undoing the Bush tax cuts for roughly the top 1 percent of households took a herculean political effort on the part of President Obama and Senate Democrats. But just from the perspective of rational self-interest, it seems goofy that, somehow, soaking the rich is barely part of the national policy conversation (the largely unheralded efforts of the Congressional Progressive Caucus aside). At some point, the federal government is going to need more revenue in order to support the social welfare programs that the vast majority of Americans know and love. Obviously, not all of that money can come from inside the top 0.5 percent. But at least some of it can. And it’s not at all clear that steeping the wealthy, so to speak, would significantly slow down the economy. I mean, it could. Maybe. Researchers generally do think that a major tax hike would be a sap on growth. But it’s a more complicated issue than many assume. Theoretically, there are at least two big, opposing forces at play. On one side, you have the so-called substitution effect, the idea that people work less when the IRS snatches more of their paycheck, because each hour of labor suddenly earns them less money, making it more attractive to spend time finally learning guitar or crafting bird houses or otherwise chasing their Zen. On the other side, you have the “income effect”—the idea that when taxes go up, some people might actually work harder and longer in order to maintain their standard of living. Which is stronger? When the Congressional Budget Office reviewed the literature a few years back, it concluded that substitution effects were a little more powerful, and that big-earners like doctors and executives didn’t act vastly different than the rest of us. Thus, we should expect higher tax rates to make the rich (and thus, the country) a bit less ambitious and productive as a whole. In theory. Still, the evidence suggests that America’s wealthiest faced a significantly higher tax burden during the country’s years of midcentury prosperity. Thomas Piketty and Emmanuel Saez, for instance, find that once corporate and estate taxes are added into the mix, the top 0.1 percent of earners paid 71.4 percent of their income to the IRS in 1960, compared with 34.7 percent in 2004. Reaching further back and using slightly different methodology, the Congressional Research Service finds that 0.1 percenters paid an average effective personal income tax rate of 55 percent in 1945, compared with around 25 percent during the late 2000s. 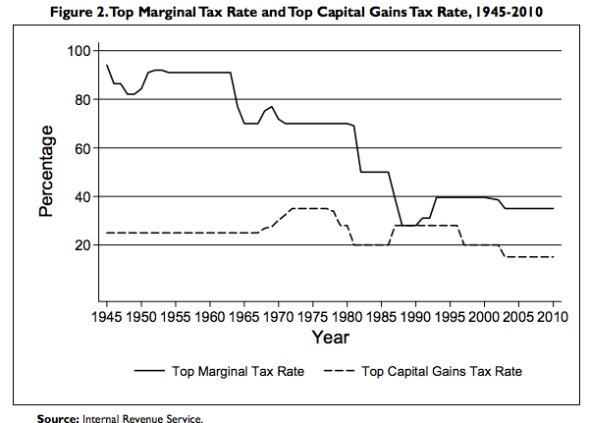 The tax code really was more progressive back in the day—and more aggressive. So, what would the ideal top marginal rate on the rich be now? That depends on your goals, and some of your beliefs about human behavior. But unless you’re philosophically opposed to government spending or the welfare state, chances are the magic number is quite a bit higher than today’s. Let’s say your only interest is in maximizing the amount of revenue the Feds collect. Conservative guru Art Laffer became famous for pointing out that, at some point, raising taxes becomes counterproductive, because people either stop working or find ways to hide their income. Thankfully, we’re probably nowhere near that point. In their most recent work on the subject, co-authored with Harvard University’s Stefanie Stantcheva, Piketty and Saez conclude that governments would net the most money from a top marginal rate somewhere between 57 percent and 83 percent (that includes state taxes, too). * Why the range? The three researchers acknowledge that, when taxes go up, the rich seem to earn less on the job. If you think that’s entirely because they choose to work less, then 57 percent is your number. However, Piketty, Saez, and Stantcheva argue that lower taxes don’t seem to spur executives and other highly paid professionals to work harder so much as they encourage them to bargain harder for extra pay, whether it’s from their board of directors or their partners at a law firm. Negotiating a bigger paycheck for yourself doesn’t actually add anything to the economy. So, if you believe taxes simply discourage that kind of tough bargaining without making star workers much less productive, then 83 percent is your figure. Like Piketty & co.’s, Krueger and Kindermann’s paper is just a modeling exercise—and models, as rough mathematical approximations of reality, are both frequently wrong and subject to revision. But it should give us a sense of how much room we likely have to raise rates, should Washington ever want to. It also shows that if we have to trade a bit of economic growth for a bigger safety net or lighter tax burden on the working class—to exchange efficiency for equity, as economists might put it—the deal might well be worth it. So, why did I start off talking about taxing millionaires, and not just 1 percenters? That comes back to Krueger’s paper as well. One of the dangers it notes is that, over time, high tax rates might not only discourage people from putting in extra hours at the office, but also change people’s long-term career and education decisions. If you’re looking at a 60 percent or 80 percent marginal tax rate once your household starts earning $391,000, that might make seven years of medical school or a law degree somewhat less appealing. 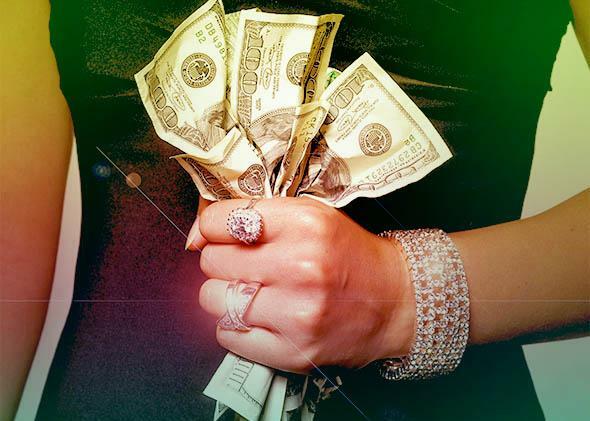 Over time, dissuading people from pursuing advanced degrees or from entering the workforce at all if, say, a spouse makes a great deal of money, would probably begin to undermine the economy in some nasty ways. But while plenty of people go to grad school with the expectation of making mid–six figures, not that many sign up because they expect to make a million. Those who get lucky and do, well, they can afford to pay a bit more to Uncle Sam. 1 One notable empirical study by University of California–Berkeley economists David and Christina Romer did find that “tax increases are highly contractionary.”* But some of their results have been challenged. Meanwhile, when Thomas Piketty, Emmanuel Saez, and Stefanie Stantcheva looked across developed countries, they found that cutting the top marginal tax rate didn’t seem to boost growth—though it did lead to greater income inequality. *Correction, April 16, 2015: This post originally misspelled the last names of economists Stefanie Stantcheva and Fabian Kindermann. *Correction, April 27, 2016: This post also originally misstated that the Romers’ study only found that certain kinds of tax increases, such as those meant to deal with an old budget deficit, were “highly contractionary.” Its results suggested that tax increases in general were contractionary, though hikes designed to deal with deficits may have been less so.